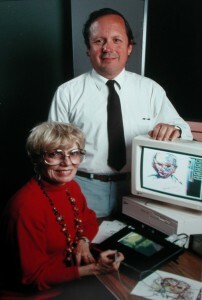 Lillian F. Schwartz pioneered the use of different types of computers and original peripherals in art, animation, optical, effects, kinetics, perception, and analysis. Her mind was never constrained by impossibilities since she endured two Great Depressions, polio in post-war Japan (where in forcing herself from paralysis to movement she learned fine brush-stroking techniques), and work in a male, science-bred organization.Fukuoka: Fragments of bodies had been burned by the Bombs into sides of buildings and many retained the shape of a human once 3-dimensional and now one, flat, singular, person-building, silent.Polio: It’s impossible. She’s not supposed to move.What mattered was pushing boundaries and not believing the obstacles arranged by others.She went to New York, The Happenings, Dali at the St. Regis with the Warhol group, E.A.T. and boisterous Billy Kluver and Rauschenberg’s brownstone with the slow-moving tortoise. She collected garbage in the Bowery; plastic balls north of Canal; motors. In 1968 she used her doctor-husband’s X-ray light boxes and painted acrylics that she laminated and placed over the fluorescent tubes. One example is “Prisoner” (Columbia U. Collection. )She befriended the president of a plastics’ factory and had him remove the chemicals that prevented the formation of bubbles. She constructed sculptures, eventually kinetic, and then her most complex piece to that date, Proxima Centauri. It catapulted her to MOMA’s “the machine as seen at the end of the mechanical age,” Christmas, 1968. Leon Harmon, an expert in visual perception at Bell Labs, asked her to drop by and that visit did not end until the demise of the Labs.The Labs embodied experimentation, foresight, a breeding ground for Nobelists. Lillian took courses in programming to manipulate the virgin digital palette and its scientifically-oriented monitors and peripherals. While waiting for magnetic tapes to record data from her punched cards to be calculated in the late 1960’s, Lillian wandered hallways poking her head into rooms and entering if something looked intriguing. Scientists eventually realized that what she wanted – complete control over pixels from machine to monitor to film – also enhanced their ability to work.From using lasers to etch art into gold circuit boards, to the first digital portrait, first animated running man with physiognomically correct joints (as opposed to the rotoscoping used up to then), first editing technique (1971) by adding or inserting solid black frames to maintain the illusion that the colors retained their saturation as well as change perception and provoke auras in patients with epilepsy to help in the control of a seizure, or eliminate strabismus in some sufferers of crossed eyes while watching the film U.F.O.s, or the black and white film “Googolplex”, where the white appeared silver. (MOMA and AT&T Collection. )She branched into art, archaeological analyses and electronic restoration. In 1984 and ’85 she worked with Richard Voss at IBM’s Thomas J. Watson research center to input part of MOMA’s art collection and the architecture of the new building, using teraflops of power to scan in sculpture, paintings, graphics, frames from films by famous artists while maintaining perspective and color. The result in 1985 was the creation of the first computer-generated Public Service Announcement and was the first PSA in this medium to win an Emmy. The PSA was commissioned by the Museum of Modern Art for the opening of the newly renovated MOMA .With one AI machine at the Labs, the Symbolics, she duplicated lists of palettes of famous artists and lists of how they moved, worked. With Unix-based machines, she proved indisputably that Leonardo used himself as the final model for the Mona Lisa. She solved the 500 year-old puzzle of the perspective construction for Leonardo’s “Last Supper”. Schwartz now has the Last Supper work in Virtual Reality, allowing the viewer to move around the simulated refectory at Santa Maria delle Grazie to view the fresco as Leonardo intended.1970Lillian Schwartz created the prototype for the first electric violin invented by Max Mathews at AT&T Bell Labs, Murray Hill, NJ using a connection to the GROOVE (Generated Real-time Operations On Voltage Electronics) system for real-time composition. Lillian Schwartz designed the first sculptural, ergonomic and hands-free telephone, as commissioned by Max V Mathews, AT&T Bell Labs. The phone had the appearance of a snake. This curved sculpture would hang around the user’s neck freeing up the hands. The microphone was at the tip of the structure directly opposite the person’s mouth. 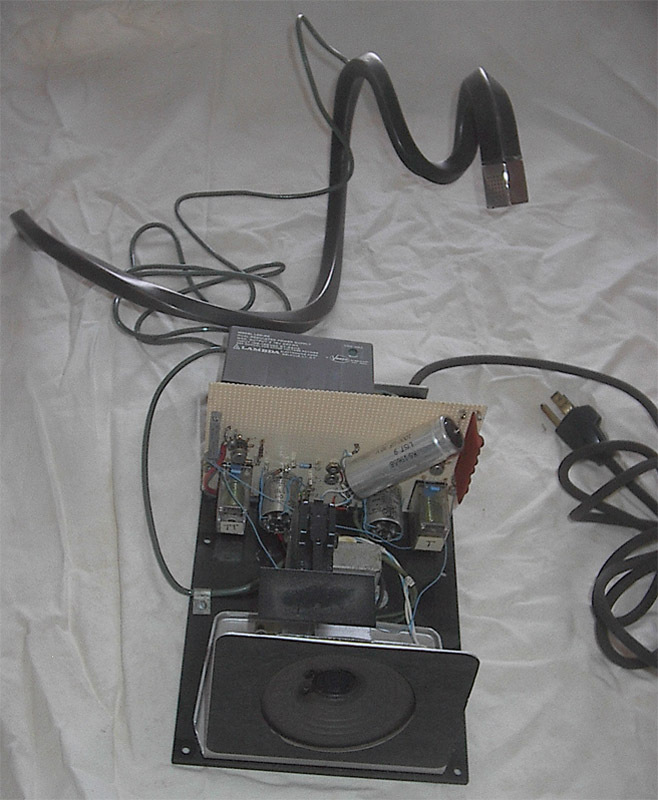 When the curved phone was removed, a point on that section rested on a black base that housed the speaker and other essential telephone parts constructed by Joe Kohut at Bell Labs. When the hands-free telephone was at rest, the telephone was turned off. Applied Edwin Land’s experiments to motion picture to give the illusion that there was color in a black and white film. Combined computer-generated effects with documentaries. “Poet of His People-Pablo Neruda”. (Funded by Corporation For Public Broadcasting and The New Jersey Public Television). Use of databases for the analysis of structure and palette choices used by artists such as Picasso and Matisse. The Visual Arts and Sciences. Vol.75 Part 6. Transactions of The American Philosophical Society. The first person to draw an electronic painting in the United States that appeared instantaneously in Germany using a pressure-sensitive electronic pen and an electrostatic writing and design tablet linked to computers. Schwartz was selected because of her expertise and facility with using the computer medium. AT&T MURRAY HILL, N.J. — As a harbinger of the advanced computer technology to come, an American artist became the first person to draw an electronic painting in the United States that appeared instantaneously in Germany. In addition, eight New Jersey and New York school children were the first to collaborate with young German artists on paintings created with interactive input from both continents. Using experimental graphics technology from AT&T Bell Laboratories, artist Lillian Schwartz and children from schools in New Jersey and New York, created works of art which were transmitted between the AT&T Bell Labs research facility here and the German Postal Museum in Frankfurt, West Germany. Two Bell Labs developments, a pressure-sensitive electronic pen and an electrostatic writing and design tablet linked to AT&T computers, allowed the artists to exchange drawings across the Atlantic. Every artistic stroke, highlight and shade was transmitted as a digital data signal via the AT&T Worldwide Intelligent Network. The exchange helped celebrate the opening of a new postal museum in Frankfurt that marks the 500th anniversary of the German postal system, Deutsche Bundespost. The New Jersey students are Kevin McGinn, 15, of Chatham High School; Vic Chu, 17, of Morris Knolls High School; Steve Eiter, 16, of Madison High School; and Luke Brooks-Shesler, 13, of Madison Middle School. The New York students are Leonardo Urbano, 8, and Claudia Maroney, 9, of P.S. 88 in Ridgewood, N.Y.; and Julie Kim, 16, and Alex Chesler, 16, of Stuyvesant High School in Manhattan. To inaugurate this international demonstration, Schwartz, a Bell Labs consultant in computer graphics, today created the first original work of art on the pen-and-tablet apparatus that instantaneously appeared stroke by stroke on an identical tablet in Frankfurt. To commemorate the event, the art work was printed on a color laser printer and given to Dr. Schwarz Schilling, government minister for the Deutsche Bundespost. Schwartz’s pioneering role in establishing computers as a valid artistic medium had its beginnings in 1968 at Bell Labs, when she created a group portrait of several colleagues on a computer screen. At the time, the effort represented the first full-scale example of digital picture processing in both the telecommunications industry and the art world. The design and performance of this revolutionary transparent pad and pen system relies on several significant Bell Labs advances in technology: a linear response force- sensitive pen, a novel filter that accurately measures pen movement, and the visually transparent tablet. As the metal pen glides across the 3-by-6-inch screen, its tip crosses a grid of square tiles created by invisible wires embedded in glass. By measuring the capacitance between tiles and the tip of the pen, the system accurately determines the pen’s point on the surface. The pen’s signal changes as the tip approaches the tablet surface, and the varying levels of force generated by contact cause the signal to increase or decrease. This sensitivity allows users to control the width of strokes appearing on the computer screen. Then, by touching the pen’s tip to a palette of computer-generated colors, users can easily create images or write notes. For the first time we are able to interact with other artists and perform in real time for audiences around the world by transmitting digital data signals over a telephone line via satellite. The purpose in making this entry above submitting any one of my other works, created with technology using better resolution and infinitely more colors, is based on exploring this new form of computer art where the performance would be a form of theater. Ever since I started adapting computers in 1968 as a medium for art, including graphics, film, video, special effects, multimedia events, and sculpture, I have directed my efforts to extending the technology to afford new ways for artistic expression for my self and other artists. Often I pose the problem and work at solving it. Sometimes requests and suggestions are presented by others. Any path that helps extend my development as an artist is a challenge as well as a necessity. Consequently, when AT&T Public Relations asked me if it was possible to find a way to create a work of art that would be transmitted in real-time over a telephone line to celebrate the 500th Anniversary of the Postal Bundespost Museum, in Frankfurt, Germany, I automatically said yes. I was excited about a real-time performance piece over long distances and felt I would find a means to make this event happen. I was intrigued with the idea of creating for a live audience in another location, or possibly collaborating on an international level in an interactive mode. This was a unique opportunity to explore another way of working with expanding Pixellence, the computer art medium. Since this would be the first time a drawing would be transmitted over a telephone line there were no previous guidelines. The first requirement would be to keep the amount of data transmitted to a minimum, even if it meant working in a lower resolution and with fewer colors than I am currently accustomed to. But the potential for adding another dimension in working with the computer medium was compelling. After consulting with my colleagues I opted to use a recently invented pressure-sensitive pen and tablet. I would be able to sketch varying line widths as easily as I could with a conventional pen or brush but I would be limited to a palette of 8 colors. I would work with red, green, blue, yellow, black, white, and grays, and have the capability of mixing these colors. Anything more would slow down the transmission. The advance was only partly technological. I could now bring back or put into it my early traditional method of handling a tool and drawing/painting and, I could also put in the intellectual understanding and use my expertise in animation, traditional painting, understanding effects of color, and their impact on the perceptual responses of the audience. Once I had the tool in place I turned my attention to the project itself. Sometimes when I work I follow my intuition to see what will work and what doesn’t. But this project had quite different boundaries than those I had worked with before. I would be creating for a live audience and with time constraints. And, while the real-time work would be animated, the final creation would be viewed as a fixed image, not on the back-lit screen where it was realized, but on the opaque surface of paper used with the decided-upon Tectronix color printer. The major issue, however, was what I would paint. would easily recognize. Then I hit upon Beethoven. I often play music while I work and had a Beethoven piano concerto in my disc player. As soon as I decided on Beethoven, with his music to set the rhythm for my brush strokes, I could turn my attention to the mode of operation I would take towards a hopefully successful performance and finale. I had a subject but now needed to address questions concerning the performance. Since the final image would be still should I then work at creating a painting emphasizing stillness? How can I best keep the audience’s attention? Where would they be seated in relation to the screen. How large would the auditorium and the screen be? Would their be multiple screens? Should I avoid perspective and use color and line alone to draw the viewer in? I had learned very early on in my art career that the placement of greys in large areas with the positioning of pure colors as accents most often realized this effect. In the first stages of the practice sessions I treated all the questions with the most negative answers. I filled the screen with the face and allowed for just enough of the hair to afford a recognizable clue. I studied the the overall shape of Beethoven’s head, the ringlets of the hair, and the identifiable frown. I worked on the features in a meticulous fashion and then abstracted the face. Even under the best circumstances it would be difficult for an audience to perceive tiny pixel-size marks. Besides, I knew I would not have the time in the allotted 7 – 8 minutes for such precise detail on September 27, the scheduled transmission date. Bob Boie, my colleague and the inventor of the pen, left for Germany one week before the performance with a duplicate set-up including a pen, tablet, software, computer, and printer. We scheduled a dry run between Germany and the US to test that all was working. For the dry run I concentrated purely on the use of the tool and my imagination, but deliberately restricted myself to sketching heads, mostly of Beethoven. It was exciting to watch the images being drawn back and forth, knowing that they were coming over a telephone line in real time and from so great a distance. In reality this practise session on September 26 was the first international transmission of art over a telephone line. All went well and I went back to my preparation for the big day. We decided that the clue for the start of my performance would be a message from Dr. Werner to me written on the screen. I started the disc player with the Beethoven music and waited. At the scheduled time Dr. Werner wrote, Good morning Lillian on his screen as I watched it appear on my screen. I then wrote Good morning Thomas, erased the screen, and started the performance. I began by laying in colors from my pre-selected palette. Then I rapidly sketched in Beethoven’s hair. I knew the hair and the face would look like chaos at first. I followed my plan sketching round and round, searching out the contours of the head. Even though the Maestro’s hair is a strong identifier I didn’t think the audience would guess who I was drawing until the characteristic frown and other features were drawn in. I was glad I decided to sketch the wiry, unkempt hair first since I found I had a bit of stage fright and my hand was shaking. By the time the hair was almost in place, and I began feeling out the structure of the face, I had calmed down. I could now work more slowly. I searched out the positions for the eyes, nose, and mouth, going around the face, inside and out, and then in the final minutes positioned stronger lines to emphasize the cheek bones, added a few strokes to suggest the clothing, and continued to pull out the features in reds, blues and purples. I deliberately worked around the periphery of the screen, touching here and there in the middle to get a sense of placement of features to capture the attention of the viewers. If I had drawn the features first I would be drawing in one restricted area and with small strokes which may not have been discernible to the viewer, and therefore boring. The larger, rapid positioning of different size strokes and changing colors held the spectators attention, and helped draw them into the performance. I also changed colors frequently to deliberately cause the viewers to pick up on another color to be brought into the process itself. This allowed for the audience to be aware of the steps in the creative decision-making. but, when I started the painting everyone sat perfectly still – captured by the colors moving around the screen, anticipating the outcome, and working to identify the image. The only way the final image of Beethoven could be presented immediately to the Officials and the Museum was to send the image to a computer-controlled printer. Over the years I have made etchings, lithographs and silkscreens, but I have always been bothered by the lack of spontaneity. Any changes were laboriously made between each pulled print, the reworking of the composition, the inking, and pulling another print. Watching the print dry, aware of the differences when the ink was wet or dry. Hours and hours alone with an assistant. Now with a printer I can work by myself. The image can be captured at any moment. The changes are made immediately. I see the print, return to the computer to alter the image, and print again to test the changes. With the printer close by I can work with great speed and responsiveness. It is the closest I have ever come in printing to what it’s like to paint. Each print is an original. They are not reproductions. In most other more traditional printing processes the image seems to be below the sheet of paper but with a computer printout the process is more direct. There need be no operator. A command from the computer sends the image to the printer which then cogitates a few seconds and the image appears directly as a waxy imprint directly onto the paper. Actually the image appears to sit on the surface of the paper. So what I tried for in the final work was to get the beauty of the color itself on paper. It’s there right on the surface before us. It was this final work of Beethoven that is hanging in the Museum to mark the first digitally transmitted drawing. 1991. Realized a method to preview OMNIMAX computer-generated film before final transfer to 70mm format. Her breakthroughs led to invitations worldwide to lecture and exhibit, to analyze problems (e.g., the Leaning Tower of Pisa), and to produce joint digital music and art concerts in Europe. Recently, although without her permission in most cases, young musicians in England have adopted her early-animated films projected on screens while they perform. Ironically, she had created the first rock video soon after joining the Labs. Lillian currently continues her research on creating images that can be viewed as true 2D images and, with glasses, as true 3D images, an extension of her exploration of da Vinci’s use of perception and perspective in The Last Supper. Pioneer in kinetics, plastic deformation and reformation, computer art, animation, analysis, the creation of peripherals, winner of major awards and honors, her soul resides in museums, students, observers. Most recently, Lillian Schwartz created the first computer-generated graphics ever commissioned for the Museum of Modern Art and received the first Emmy ever awarded to a computer-generated Public Service Announcement. In addition, Schwartz discovered the identity of the only authentic image of Shakespeare to be none other than Queen Elizabeth I. She previously solved the mystery of the models for the Mona Lisa and solved the 500 year-old puzzle of the perspective construction for Leonardo’s “Last Supper”. Schwartz now has the Last Supper work in Virtual Reality, allowing the viewer to move around the simulated refectory at Santa Maria delle Grazie to view the fresco as Leonardo intended. 1963. Use of wet paper technique for watercolors. Land of Nod. (Exhibited The National Academy American Watercolor Society). 1968. Fuse paints on acrylic by lamination. Prisoner. (Columbia U. Collection). Established the computer as a medium for artistic expression in graphics, film/video, special effects and solving controversies in art analysis. 1970. Received Cine Golden Awards for Computer-generated Art Films. UFO’s; Pixillation, and 6 others. 1971. Invented first 2D/3D Film without Pixel Shifting. 1972. Changed the surface of plastic for sculpture. Sculpture # 3×11. (Newark Museum of Art Collection). 1972. Computer-generated graphic acquired by the Museum of Modern Art. (Poster for Knowlton for Mayor). 1972. Computer-generated Art Films invited to Cannes, Mutations and 2 others. 1972. Applied Land’s experiments to motion picture to give the illusion that there was color in a black and white film.. Enigma. 1976. Used the computer with film to express human activity from cradle to old age. Pictures From a Gallery. 1976. Created early Rock Video and coined the term. “On-Line”. 1977. Introduced artistic use of digital picture processing to Television. Trois Visage. 1977. Created the first Appropriation art by computer. “Homage to Duchamp”. 1978. Combined computer-generated effects with documentaries. Poet of His People-Pablo Neruda. (Funded by Corporation For Public Broadcasting and The New Jersey Public Television). 1979. First time use of adapting Picture/telephone equipment to capture in real-time Pierre Boulez conducting his composition “Rituel”. Premiered at IRCAM, Paris. 1981. First time computers were applied as an aide to unraveling puzzles in archaeology. Schwartz used the computer to reveal the common entrance to the Military and Commercial Harbors at Carthage solving the archaeologists’ six-year search at the dig on the site. The riddle of the common entrance to the harbors was one the scientists at the dig could not solve. It required the input of a tremendous amount of information into the computer. The question was answered six thousand mils away from the site. Schwartz produced “Carthage”, a documentary showing a computer rendering of the findings as well as the first use of computers in archaeology to “repair” shards to help the scientists determine the dates of their artifacts. Funded by WNET CH.13 and The Explorers Club. 1985. Use of databases for the analysis of structure and palette choices used by artists such as Picasso and Matisse. The Visual Arts and Sciences. Vol. 75 Part 6. Transcations of The American Philosophical Society. 1985. Created the first computer-generated Public Service Announcement and was the first PSA in this medium to win an Emmy. The PSA was commissioned by the Museum of Modern Art for the opening of the newly renovated MOMA. 1986. 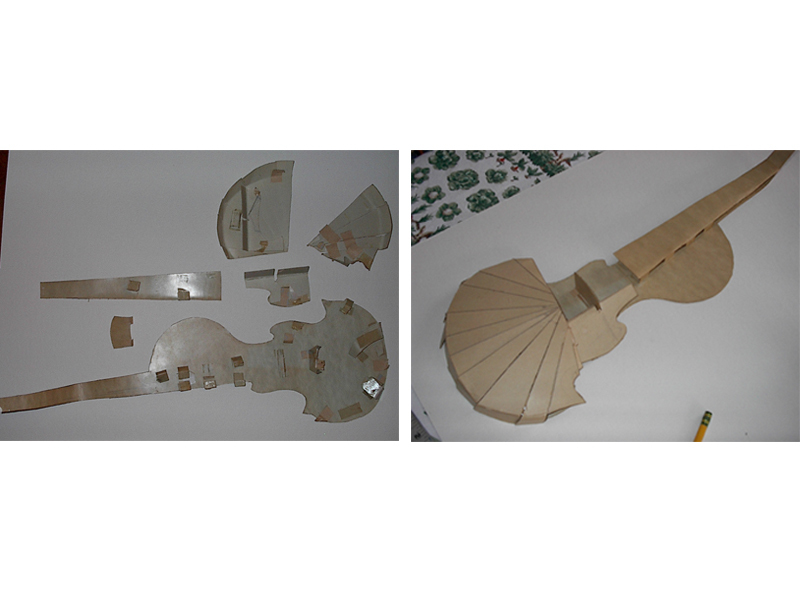 Built first finite model with Professor Madara Ogot and his PhD. Student Zheng at Rutgers University of The Leaning Tower Of Pisa at the request of a group under the late Art Historian Eugenio Battisti. The model was used for testing strengths and changes to help the Tower Committee Engineers to build structures to enforce the Tower to enhance its lifetime. Before the use of the computer to test techniques in the Virtual world there were often devastating, irreversible damages inflicted upon the structure. 2007. Earlier Schwartz had solved the controversy of the perspective construction Leonardo used in his “Last Supper” and where in the Refectory one should be positioned to view the 2D depicted space as an extension o f the real room. Schwartz revisited Leonardo’s “Last Supper” to analyze the odd positions of Jesus Christ’s Right hand and Judas Left Hand which resulted in a new analysis concerning Leonardo’s intent in positioning Christ’s right hand in such a way that it would have had to be supported. Schwartz copied a glass from the table, moved it into Jesus Christ’s right hand to find the perfect object for Christ’s hand to rest upon or grasp. Schwartz’s findings reveal the two stories that Leonardo painted e.g. the before and after the crucifixion, thereby changing dramatically the role of Judas in the Crucifixion. Note: this is the only painting of a Last Supper where Judas is positioned on the same side of the table as Christ. 2010. Most recently Schwartz discovered the identity of the face on the Turin Shroud. “Discovery Channel” made a documentary but did not include Schwartz’s final analysis: Leonardo used his own Canon of Proportions to create the well-known “Vitruvian Man”. The features of the Vitruvian Man matched Face on the Shroud perfectly. These results were aided by a study in the early 2000s where Schwartz solved the controversy concerning Leonardo’s “Grotesques” and whether he painted them from life or feigned them. Schwartz’s results demonstrated that he did use his own Canon of Proportions. Proof of his process was determined by interchanging features from one face to another. This could have been the basis for the first Police Identikit.